Many of my clients find it challenging to meditate on their own. So I have created these guided meditations to help. Some of them are for relaxation purposes, whilst others will help you to delve into a deeper understanding and healing of yourself. Here is a 35 minutes audio track (music only) to help you keep your chakras or vital energy centers, clean and healthy Should leave you with a feeling of peace and greatness, rejuvenated, balanced and clear. Listen preferably on headphones. 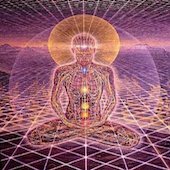 The music contains binaural beats synthesis which activate different brain frequency patterns that put your consciousness into a theta state, meaning a deep state of relaxation. Pure tones engaging the source frequencies of each of our major 7 chakras are gently bathed in the music. When I find something that I love or that inspires and helps me, I want to share it. Here are some links to these products which you can buy through my Amazon page. Every time you purchase via these links, my affiliate fee is automatically donated to the Whole Planet Foundation who aims to alleviate poverty through micro-finance institutions. £12.99 The many amazing cases studies of the applications of the placebo effect will empower you to personally use ‘the expectation of a particular outcome’ to alter your internal states – as well as external reality – solely through the action of your mind. £ 6.20 Habits are more powerful than your will – if you know how to make them work for you. Drawing on hundreds of fascinating studies, psychologist Jeremy Dean shares how the new brain science of habit can be harnessed to your benefit. £9,31 DM Ruiz shows us how to heal our emotional wounds, recover the freedom and joy that are our birthrights, and restore the spirit and playfulness that is vital to loving relationships. The mastery of love was a total breakthrough for me, changing the perception I had of the matrix of society, enlarging the size of my world and giving me wonderful tools to heal my love relationship.